The Natchitoches Times staff visited two schools, Weaver Elementary and E-Lab, Wednesday, Aug. 15 during afternoon bus loading to observe the progress made since Monday. The change of bus transportation company to Ecco Ride in July as well as the transition to the branding of schools created issues with pick up and drop off of students. Staff at Weaver Elementary said they were on site until after 7 p.m. Monday to ensure all students were picked up. By 3:38 p.m. Wednesday, all students were placed on buses and the lot was cleared. I visited Weaver and spoke with bus driver Tony LaCaze and bus aide Brenda Smith. “It’s going pretty smooth,” LaCaze said. “We’re ironing out the wrinkles. Everything is falling into order.” Smith said if students were placed on the wrong bus, they were taken home. “No matter how long it takes, if they are on our bus, we are going to get them home,” she said. With years under her belt on a bus, she has a system for making sure the students on her bus should be there. “On the very first day… I got a pad and wrote everybody’s name down that I possibly could that morning, and what I missed I got that evening. I go through my checklist and I make sure they ride every day.” She has a system for checking off when they get on the bus in the morning and for marking them off as they debark in the afternoon. She also requested a turn by turn list from Ecco so she had names, addresses and other information on hand. LaCaze and Smith said they had the same route last year and knew the majority of the children. “That helps. We only have two more stops this year to get to know,” Smith said. Assistant Principal Alyson Erikson, left, and a staff member help a student determine which bus to ride. LaCaze said students leaving school early has been a problem in the past. The bus drivers are not notified so they sometimes have students that ride in the morning, but not in the afternoon. Ecco Ride representative Ryan Johnson happened to be monitoring the activity at Weaver as well. He said there were “tangible differences” between Monday’s situation and Wednesdays. “We are checking on routes and coverage areas and seeing what was missed and how,” he said. One precaution they implemented was an overflow bus for students who missed their bus or for students whose bus was full. That happened in instances where there were areas heavily populated with students and a single bus couldn’t hold all the students. “We wanted to have it there as needed,” Johnson said. Of the 85 or so buses in the fleet, 20 had already been outfitted with permanent placards by Wednesday afternoon. They are on the side of the bus near the door. As buses rolled up, their route number was relayed inside the school, then staff escorted those riders to the bus stop area. The next bus pulled up and those riders were taken to the bus. The system was working perfectly until a student realized they were in the wrong line. Staff Gloria Wilson and Armetrice Williams, assistant principal Alyson Erikson and Johnson collaboratively figured out which bus the student should ride and resolved the issue. 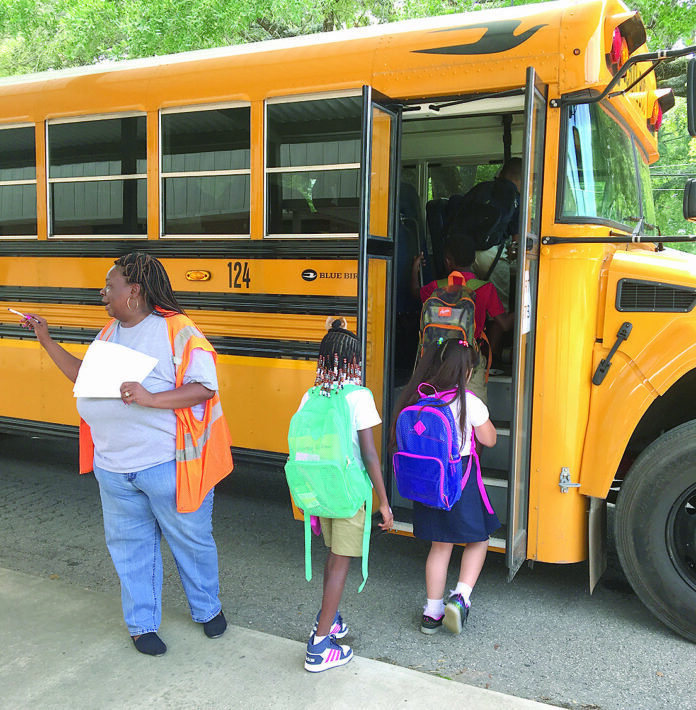 Weaver students board the bus under the supervision of school staff. At NSU E-lab, the majority of students travel to and from school via car according to Principal Caron Coleman. The cars arrive with color-coded tags on their rearview mirror that denotes the grade level of thier particular student. Johnson said there were more bumps in the road Monday than on a normal first day of school, but expressed appreciation to the drivers and school staff who worked extra hard to develop plans that were already in place and working by Wednesday. “We will be reworking what needs to be addressed and doing what needs to be done….confusion happens when you have big changes and now have several buses taking your children to different schools. We’ll make the changes that need to be made. Weaver employee Armetrice Williams and Ecco Ride representative Ryan Johnson, from left, ensure students are on the correct bus by checking printed lists and utilizing two way radio communication with bus drivers. In an effort to help the students at Weaver, Johnson said he had stickers printed the students could wear that would have their name and bus route number on them. Williams and other staff offered to distribute the stickers that were delivered Thursday morning. “Whatever it takes to line things out, we’ll do it,” Johnson said.